Are you exploring emotional intelligence assessment options for yourself or your team? Keep these key points in mind when looking for the right one. What is an Emotional Intelligence Assessment? An emotional intelligence assessment is not a personality test. There is a huge difference between the two. Personality type assessments merely attempt to identify an individual’s motivation and internal perception (self-awareness). In effect, the “type” results are a static element. Knowing that you are an introvert or extrovert, while interesting, is unlikely to change. Therefore, personality “type” provides little in the way of guidance or improvement. Conversely, an emotional intelligence assessment seeks to identify many more facets. 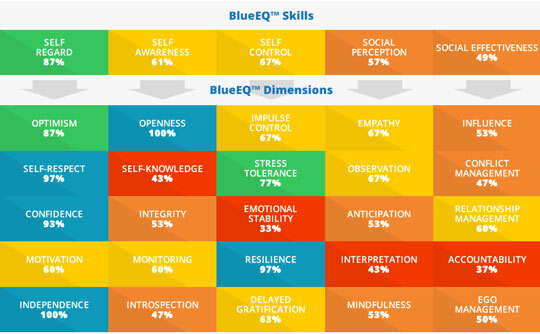 The emotional intelligence assessment measures in terms of five skills: self-awareness, self-regard, self-control, social effectiveness, and social perception. Combining all this information, in effect, provides an overview of the individual’s psychological perspective for a moment in time. We’ll call this a psychological snapshot. Overall plans may differ, but most recommend reassessing individuals on a schedule. While reassessing does require more time, there is an overwhelming benefit to the commitment. Over time, these additional assessments provide new data points. As these psychological snapshots accumulate, trends become visible and we see the changes. These changes, after all, are what we desire. Because this plan involves multiple points in time, it needs to be efficient and thorough. Many assessments, either EQ or Personality, take 30 minutes to over an hour. On the other hand, some other assessments take very little time asking as few as 15 questions. Of course this limits the data collected, thus the thoroughness. Because we are reassessing at a planned interval, we need to find something more concise. Our partners at BlueEQTM provide such an assessment. The self-assessment consists of 150 questions and takes only 20 minutes to complete. Certainly, you can find 20 minutes, every few months, for self-improvement. Expect a detailed analysis of the participant’s results. In order to be meaningful, we need enough data points to build the psychological snapshot. Additionally, it must be easy to understand. Have a look at the BlueEQTM assessment results below. These results meet the requirements illustrated above, detailed yet easy to absorb. As you can see, it takes the form of a colored heat map. In one graphic, the participant can quickly identify those areas that will be of the greatest benefit to improve. They can easily identify factors for each skills and dimensions accordingly. With these factors in mind, individuals identify the skills and behaviors they wish to improve. In brief, they develop a personal development plan. Thus, providing a systematic approach to ensure the highest levels of success. Something that Scott Mautz, over at inc.com, learned when he took the assessment. In summary, an emotional intelligence assessment, when carried out properly, provides actionable results. Take 20 minutes to begin a lifelong change. Contact us to take an emotional intelligence assessment for yourself, your team, or your company today. Do you still have questions about emotional intelligence assessments, and its key concepts?